It has been a cold, mostly rainy and busy start into 2019, but suddenly spring is here! And what I had started a year ago with the – somewhat random – introduction of the “Blessing Seal of Spring”, has now evolved, and sees a new manifestation with the completion of my “Spring Blessing” incense! As temperatures rose to 17 °C today and the sun warmed up the city unhindered, I could feel the excitement and eagerness in the air and with the birds around our place. So I am happy to present you this new incense blend, which is of course – how could it be different – again my favorite! 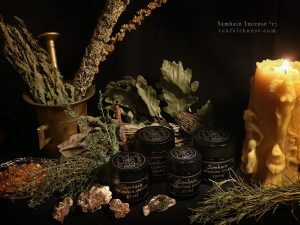 So, this brand-new Teufelskunst creation is dedicated all to the rituals of spring, including the celebration of the Vernal Equinox, Easter, the Roman Veneralia and leading up to Beltane. It smells pleasantly sweet and spicy, thanks to fragrant and traditionally spring related ingredients, such as clary sage, dammar, lemon grass, myrtle, violets and sweetgrass. In addition, yellow flowering primrose and amber resin evoke the sun and fire. The return of the vegetation, and pollinators along with it, is honored with precious bee propolis, which adds a warm and earthy aroma. For fertility spells and referencing the very essence of Venus, the blend contains further aromatic apple peels from our own apple tree. Water mint and willow both connect this blend to the element water, evoking Batrachian and ophidian currents. The old Irish Beltaine is derived from common Celtic *belo-te(p)niâ, meaning “bright fire”. Fire is often part of spring and May Day celebrations, e.g. for cleansing (burning) the old and making way for the new or as a primitive reference to the return of the sun. With the arrival of autumn and in view of the last warm weekend for this year, I am delighted to share some seasonal musings and the most recent shop news with you. 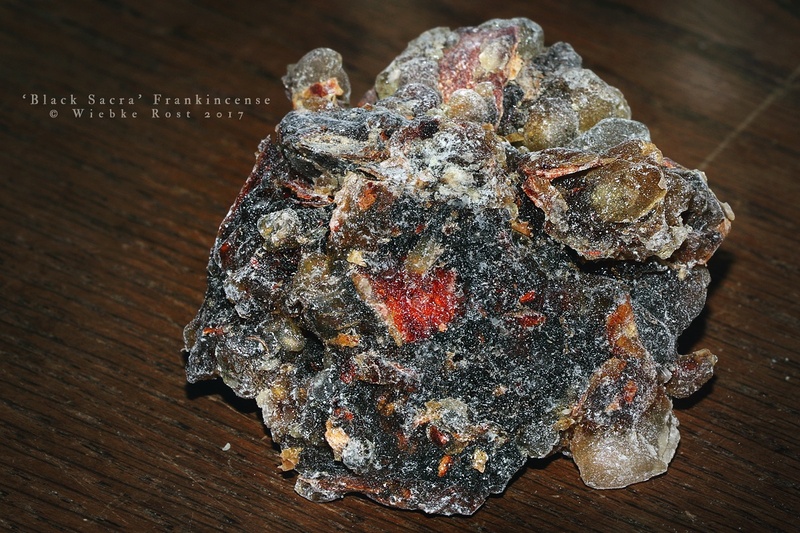 As I am typing, my hands smell of fragrant cempasuchil flower… the day before though they were still sticky from the self gathered pine resin. Both are ingredients in incense blends individually dedicated to the season’s various feast days. Rural people’s survival depended on the harvest. The fear of loosing the harvest, fierce autumn storms, the long nights etc. was real. It was essential to secure the harvest and protect the home, barn and family. It was custom to cleanse and protect the home by burning herbs. 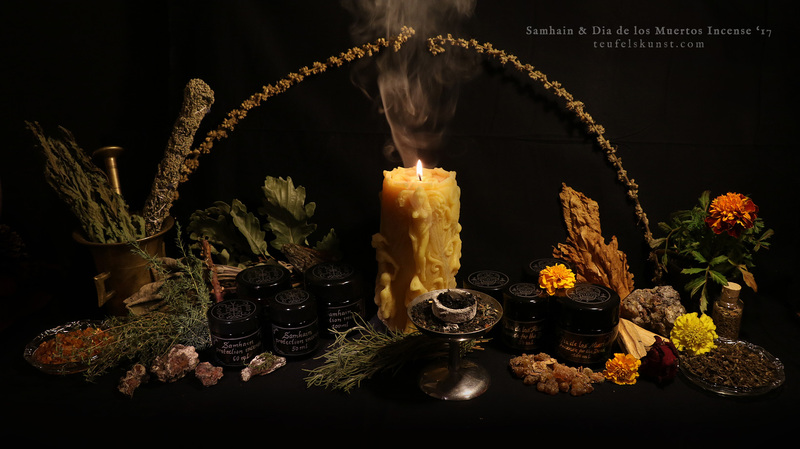 Herbs associated with protection and healing, as well as the opening of the gates to the spirit world, are hence part of my Samhain incense. From the need to protect oneself may also have sprung the latter-day custom of placing candles in hollowed out objects. Readily available were turnips or pumpkins, then turned into figurative lanterns sporting demonic grimaces. Similar to the scarecrow, the lantern was to ward of the ‘evil’ and at the same time its flame lit up the long nights. This “light in the dark” is embodied by the amber, fossilized tree resin. Amber is called Bernstein in German, from Low German börnen, meaning “to burn”. The Greeks knew it as ḗlektron, from ēléktōr, meaning “shining sun”. Samhain also marks the time when deciduous trees have shed most of their leaves. The leaves fall to the ground, decay and nurture the cycle of life. The wood keeps men warm, the bark heals. The evergreen conifers deliver in addition aromatic resins with cleansing and healing properties. An important part in this incense is thus the rosy red resin gathered from pine trees in my area, as well as fragrant juniper wood and needles from my own garden. When burnt, the blend develops a strong white smoke and is best used outdoors or in a well ventilated area. If used indoors, air the room and then enjoy the scent, which will last for days. 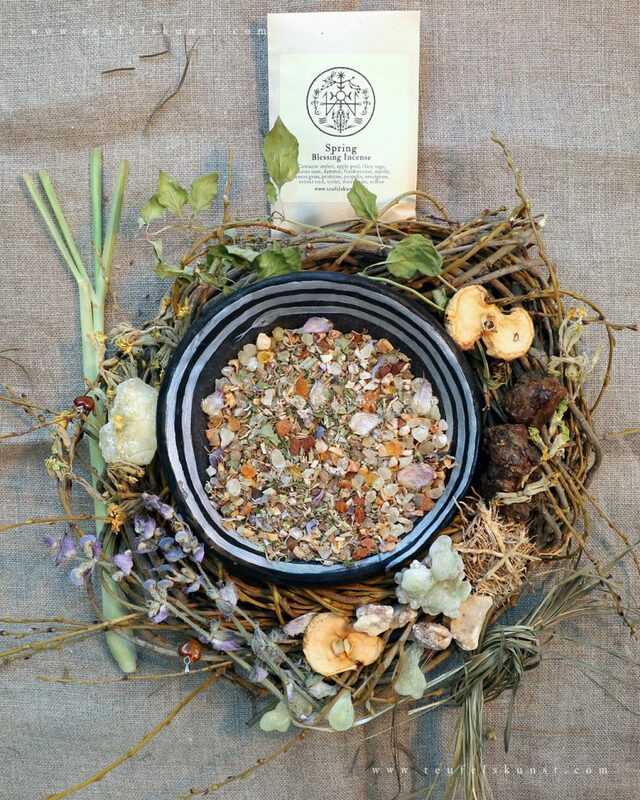 Use: Use this incense blend for cleansing, healing, protection and communication with the spirits. 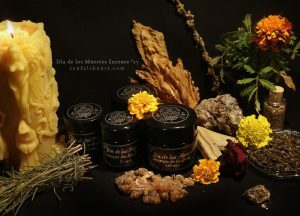 Its fragrant ingredients evoke in particular the spirits of the wild/ sylvan realm and may aid in re-connecting with the spiritual world of the forests and wilderness. It can also be used on the “Totensonntag“, for contacting one’s ancestors and for protection from “Wiedergänger” (revenants). The pagan festivities surrounding Samhain have been substituted by Christian feast days throughout a large part of the Western world. Folkloric customs are a part of marketing schemes. From the pagan Samhain to the Christian All Saints day, the modern world celebrates “Halloween” with plastic skulls, led pumpkins and dressing up as corpses. Everyone can be a zombie for one day and night and feel more alive than the rest of the year. Halloween gives a good example for cultural appropriation gone wild, every year a little more. But I blame none. Because it is part of human nature, both to adopt other traditions as well as to defend one’s own culture and rituals. One of these traditions that have been sinking into the Western world and heavily influence our aesthetics, is the Mexican Dia de los Muertos. As the festival in Mexico grows bigger and becomes more impressive every year, so grows the fascination with it outside of Mexico. Just like the cult of Santissima Muerte grows in numbers both in and outside Mexico. Death worship is real and prospering. It is nothing extraordinary. All over the world people venerate their ancestors and spirits of death, with altars at home, at their graves or in temples or chapels dedicated to them. And often there are special festivals dedicated to the veneration of the dead. In some countries these celebrations fall in the months of July and August, such as the Japanese Obon or the Argentinian feast for San la Muerte. In other countries they center around the days and nights spanning from All Hallow’s Eve (October 31st) to All Saints (November 1st) and All Souls Day (November 2nd). A funny exception is Germany, where it is custom to visit and adorn the graves of family members on the Totensonntag (the “Sunday of the Dead”). It falls on the last Sunday before the first Advent (usually at end of November) and, though of Protestant origin, is a protected holiday in all of Germany. And death is no funny affair in Germany, as the day is meant to be spent in silence, e.g. it is forbidden to dance or play loud music in public. So, for me “Halloween” is not the time to commemorate my ancestors. But it is still a special time of the year, during which I am free to explore and find light in other traditions. This way of approaching the dead is very different from the official German custom. Since a few years I have joined in the tradition of baking bread of the dead and incorporating some of the Mexican elements in my own worship practice. I can tell it kept me busy! This year I am forced to cut down a bit. 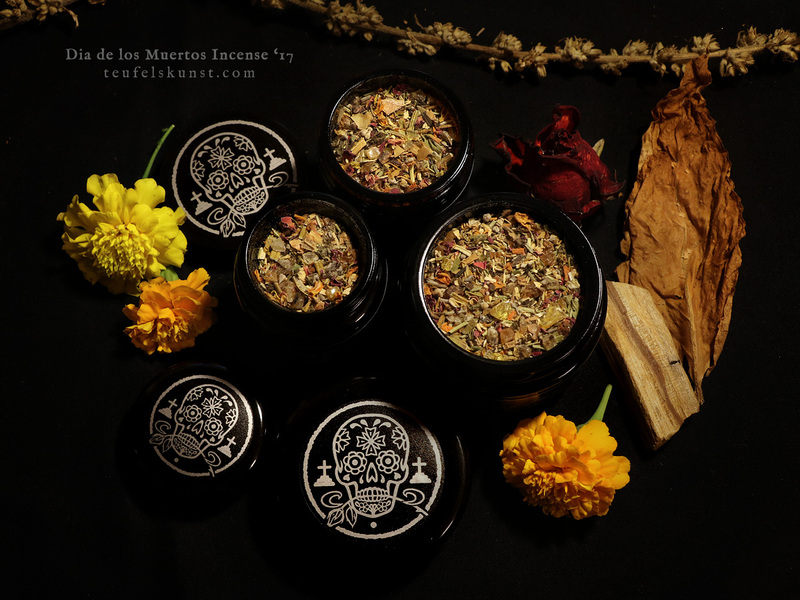 I hence created this incense blend for the day of the dead, with favorite ingredients and my own Calavera design. This incense blend is foremost dedicated to the Mexican tradition of venerating the ancestors, but may also work in the contexts of European ancestor veneration, as it simply pleases and honors the beloved dead. 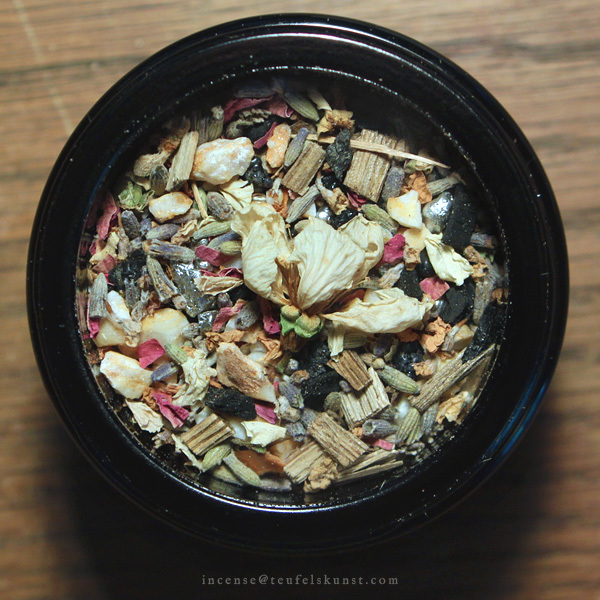 Alternative incense blends for these occasions can be found in my shop. 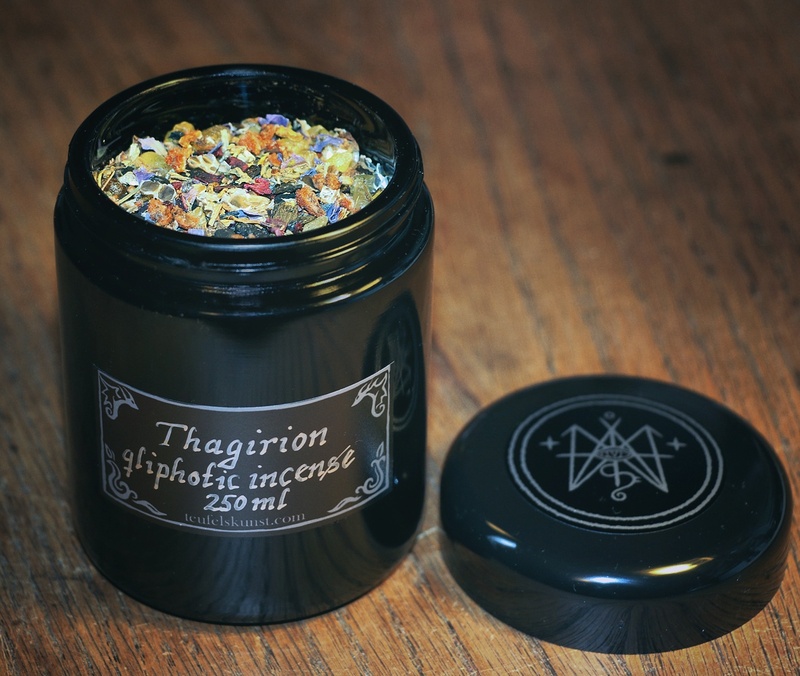 I am delighted to share with you pictures of the second batch of the Thagirion incense, which is now back in store. The formula has been updated, containing passion flower in addition to the ingredients discussed earlier. This is the perfect blend to use on the upcoming annular solar eclipse of February 26th, 2017. Too late to order? Don’t worry, you will get a second chance on August 21st, 2017 with a total solar eclipse occurring over the Western hemisphere, which will be partly visible also in Western Europe. Limited stock. Offer good while supplies last. The most exquisite incense blend I may have composed up to this day, contains costly aloeswood, sakura blossoms, white lavender, benzoin siam resin etc. and is my personal “if all else fails” agent. I made it recently for myself and for my dad, who was extremely moved and emotional over receiving it. He does not burn it as incense but simply enjoys smelling on the incense glass. The blend itself is inspired by a dream of flying – an intense and surreal experience. Imagine you are flying on a magic carpet and find yourself enveloped in a whirlwind of sakura blossoms*, their tender petals gently brushing your face. The magic carpet moves swiftly and carries you further, across endless lavender fields, letting you observe the world from a birds eye view. In an abandoned landscape garden fragrant roses release their sweet scent in the sun’s warmth. At the end you land smoothly, in a familiar place, with both feet planted firmly on the ground. In my dream this place was near a cemetery, I had been visiting so often and there I met and received guidance from a dead friend. 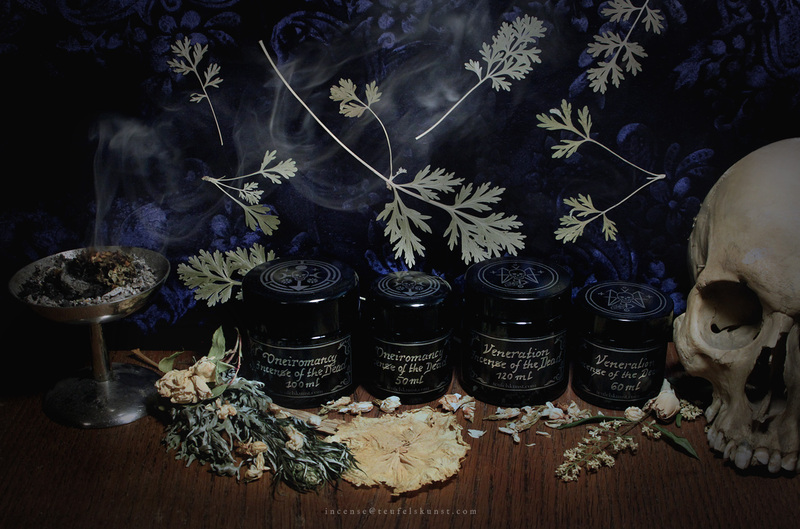 Whilst the incense blend does not contain any necromantic herbs, it can still open astral channels to one’s tutelary spirits, which may also include dead friends. Besides, this incense provides a good alternative for persons allergic to mugwort etc. 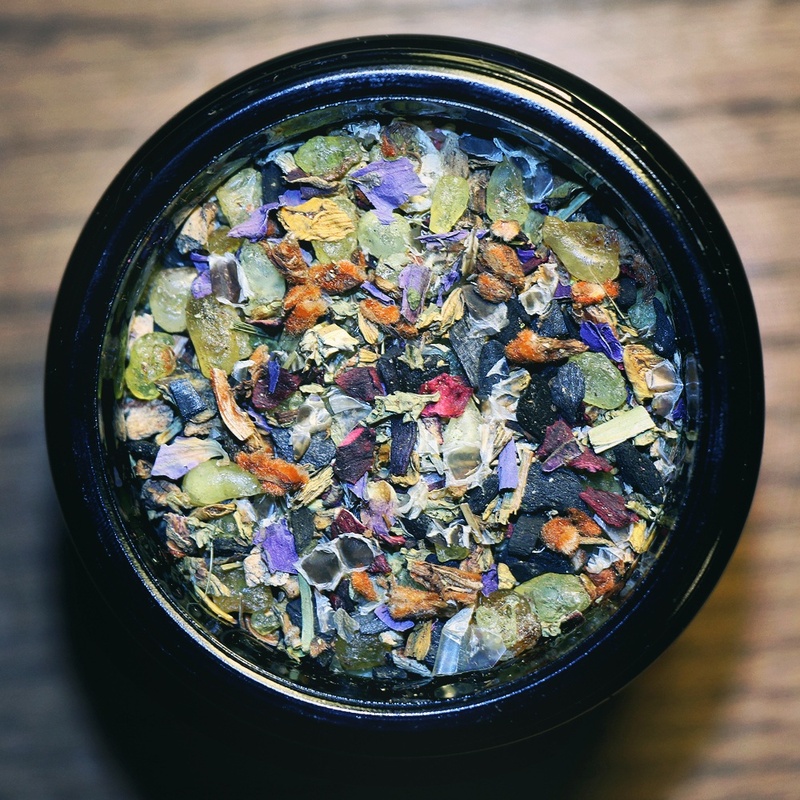 This blend is designed specifically for contacting the dead in dream and receiving advice about the future. It contains the same ingredients as the veneration incense of the dead and is enhanced with soporific and oneirogenic ingredients, e.g. sandarac resin, mugwort, jasmine and brugmansia flowers, privet flowers and white rose buds. The blend should be burned an hour prior to sleep, in a calm surrounding. It is meant to help the practitioner find a calm state of mind and enter a deep and restful sleep, which is the premise for experiencing sustained and long dream sequences. The same blend can be used for ritually recalling these dreams. It is helpful to use a photograph and other personal links to the dead, whose presence is sought in dream. These links can be placed for example beside the bed or under the pillow. Safety advice: Please do not leave burning coals unobserved! Don’t burn incense if you feel too tired to pay attention. Instead simply smell on the jar before sleep and burn the incense, when you are well rested and want to revisit the dream experience. 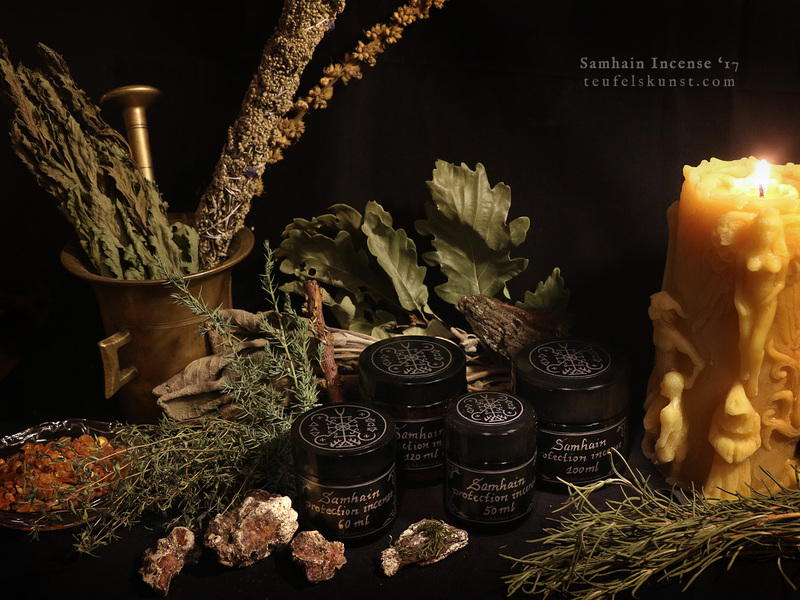 This list is far from complete, but gives an idea to which end certain resins and herbal agents can be employed in connection with the dead. The blends presented above are meant as starters for exploring the vast and increasingly complex field of “necromancy”. This is the third in a series of ritual incense blends designed for working with the qliphoth (or kliffot). It is dedicated to Adramelech, the ruler of the eighth qlipha on the tree of death. The corresponding qlipha is named Samael, Hebrew סמאל, meaning “poison of god”. The qlipha and its ruler are associated with Sha’arei Maveth (or Shaarimoth), the “gates of death”, one of seven infernal habitations. Adramelech is described as a “powerful king”. He is one of the eleven heads that govern the qliphotic pantheon. Similar to other demonized deities, Adramelech was once worshiped as a sun god. His worship later merged with that of Moloch. In Collin de Plancy’s Dictionnaire Infernal, Adramelech is depicted as a mule with peacock feathers, evoking associations with Melek Taus, the “peacock angel” of Yazidi religion. Melek Taus is worshiped for his independence, since he refused to bow to Adam, the first created human. The story resembles that of Shaitan in the Quran. In Islam this refusal to bow to god’s creation is interpreted as a display of sinful pride. Melek Taus however, reasoned that he was made of god’s own light and could not bow to Adam, who was made of dust. Therefore god rewarded Melek Taus and made him his deputy on earth and leader of the other angels. The peacock’s appearance is sublime and likewise Melek Taus proved knowledge of the sublime in his choice. Besides this the Yazidis view the peacock as a symbol of immortality. Samael also appears as an independent figure: for once he is described as an accuser, seducer and destroyer and a “chief of evil”. At the same time he occurs as an arch-angel, residing in the seventh heaven, as the chief angel of the fifth heaven and features as the “angel of death” in Jewish lore. In the old testament he appears as the serpent in the garden of Eden, and as a demonic entity and spouse of Lilith. As the serpent in the garden, Samael seduces Eve to eat of the fruit from the tree of knowledge of good and evil. Similar to Prometheus, who steals the fire from the heavens and, against the will of Zeus, brings it to mankind, Samael delivers the gift of gnosis to the first humans, even though god had forbidden them to partake of it. Henceforth they are expelled from the garden, and the serpent along with them. Samael becomes the consort of Lilith and they breed demonic children. Eve, impregnated with the seed of the serpent, begets Cain, the son of Samael. Cain slays Abel, and is exiled to wander the land of Nod. But he is protected by a mark, which his father Samael placed on him. This mark is a warning that, whoever attempts to harm Cain, will be punished sevenfold. The above aspects are of relevance, since the different manifestations of Samael here sort of merge with the qliphotic king Adramelech. All aspects surrounding the qlipha in question are taken into account, before advancing and concentrating the essential links within a single incense blend. Now let us look at the planetary influence: Adramelech’s qlipha is placed under the influence of Mercury. The corresponding element by the same name is a white-silvery metal, liquid at room temperature and poisonous. Early uses of mercury include the making of divinatory mirror bowls, which were found in elite Mayan tombs. Today it is employed in liquid mirror telescopes. Mercury is also called quicksilver. In alchemy it represents the “spirit” and is attributed with various transcendental properties, due to its volatile nature. The god Mercury (Greek Hermes), is the messenger travelling between the realm of the gods and the world of humans. In his underworld manifestation, Hermes chthonios, he acts as a psycho-pomp, guiding the souls of the dead through the netherworld. Of interest in connection with Adramelech and his qlipha are transcendental, transforming and empowering properties that reach beyond the realm of the living and this world. What lies beyond the reflective mirror’s surface? Which herbs help with clear sight and telling the lie from the truth? Which herbs aid in seductions and can confuse or blind an opponent? Which plants and resins assist in opening the “gates of death” and contacting and mobilizing the souls of the deceased? The incense for the work with this qlipha and its ruler is hence complex in nature. The sublime king Adramelech becomes a dark soul-guide, residing beyond the gates of death and initiating the wanderer into the perilous poison path, confusing or leading him/her through his kingdom in the sitra ahra. 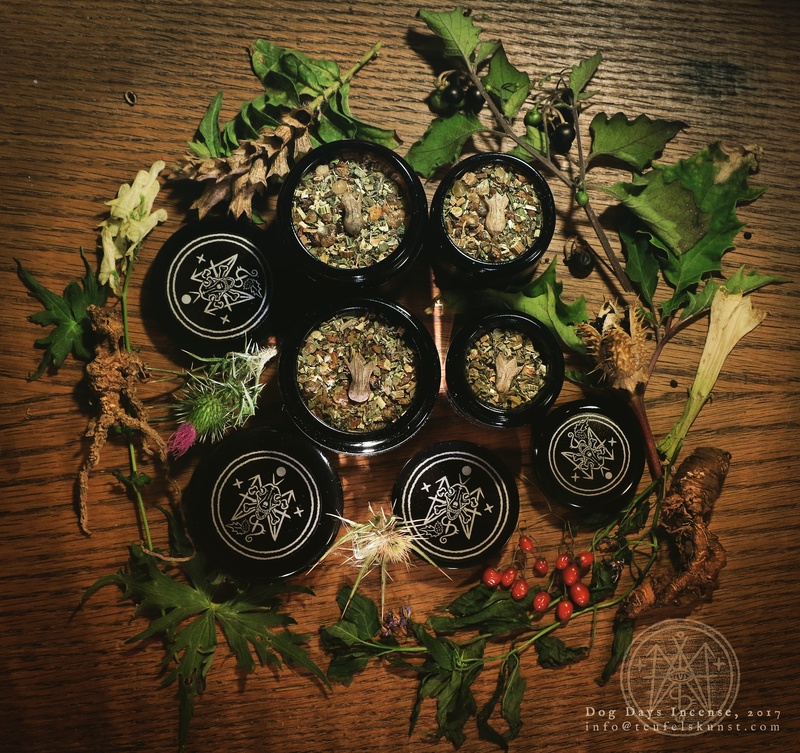 Details: The first eight 100 ml jars are numbered and accompanied by a peacock eye-feather as well as one hand-stained, emerald green Teufelskunst flyer. The remaining incense comes without extras and is not numbered. *Contains some venific herbs. Only for advanced practitioners. Or message me for a customised blend.